The New York Times is drawing well-earned plaudits for yesterday’s news-making interview with President Donald Trump. In their wide-ranging conversation, reporters Peter Baker, Michael Schmidt, and Maggie Haberman repeatedly used to great effect a strategy of asking open-ended questions and gently prodding the president along, breaking lots of new ground with regard to the ongoing Russia investigation. But in contrast to its other successes, the Times missed out on an opportunity to get Trump to answer questions about health care policy. There was certainly a need for such an interrogation. The interview came just days after the Senate health care bill collapsed because conservative and more moderate Republicans were unable to reach agreement on the legislation’s contours. 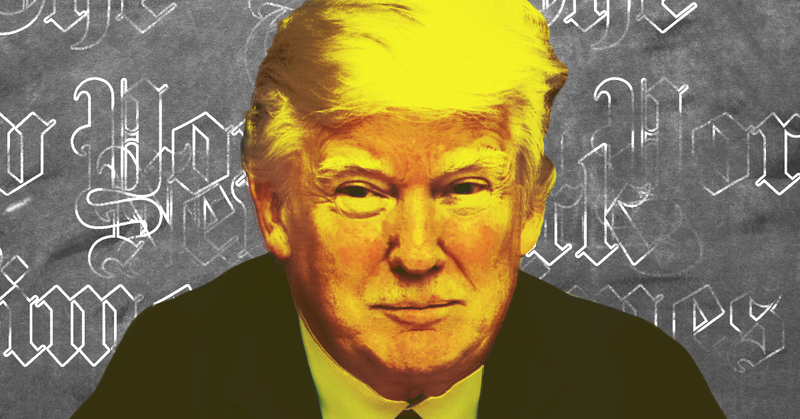 Trump has been generally vague about which side’s policy views he favors, but he supported the Senate legislation even though it violates many of the promises he has made to the American people. In tweets and other public statements since it became clear the bill lacked the votes to pass, Trump has taken a variety of positions on what to do next. Based on the voluminous excerpts from the interview the paper has published, which “omit several off-the-record comments and asides,” the Times reporters appeared to make no real effort to get at any of the contradictions surrounding Trump’s health care position, or to elucidate for their audience the type of policies he favors. Millions of people will be impacted by the results of this debate; the Times reporters, though, seem primarily concerned with the senators who will vote on it. PETER BAKER: Good. Good. How was your lunch [with Republican senators]? MAGGIE HABERMAN: That’s been the thing for four years. When you win an entitlement, you can’t take it back. HABERMAN: How about the last [meeting with Republican senators about health care] in June? Do you guys remember how many came? MICHAEL SCHMIDT: How’s [Senate Majority Leader Mitch] McConnell to work with? As you can see, their questions about health care were almost entirely driven by the process and politics of the bill. The closest they came to asking about policy was Haberman’s vague question about whether Trump is “generally of the view that people should have health care”; Trump responded, “Yes, yes,” and the conversation moved on. There were some tantalizing openings for the reporters to quiz Trump on his health care policy views that were not taken. At one point, Trump said of Obamacare, “Once you get something for pre-existing conditions, etc., etc. Once you get something, it’s awfully tough to take it away.” A reporter could have followed up and asked why, in spite of the political challenge, Trump believes there is a policy imperative to remove that guarantee and limit the ability of people with pre-existing conditions to gain coverage. Because you are basically saying from the moment the insurance, you’re 21 years old, you start working and you’re paying $12 a year for insurance, and by the time you’re 70, you get a nice plan. Here’s something where you walk up and say, “I want my insurance.” It’s a very tough deal, but it is something that we’re doing a good job of. I don't really understand what the president is saying here. He appears to be claiming that the model for health insurance is people pay a very low amount of money beginning when they are young and hope to garner benefits when they are old. If true, that’s a staggering display of ignorance; that’s how term life insurance works, not health insurance. Unfortunately, it’s hard to really nail this down because there were no follow-up questions. The failure of the Times to ask the president tough questions about his health care position is all the more important because there have been vanishingly few opportunities for reporters to do so. The president has largely retreated from press scrutiny in recent months. Trump has not held a full press conference since February; he broke with tradition and did not hold one following the G20 meeting earlier this month. His only on-camera interviews in the last two months have been with the pro-Trump propagandists at Fox and, most recently, with The 700 Club’s Pat Robertson, who has said the president’s critics serve Satan. This is unfortunately typical of a media that has largely focused on politics and process, not policy or the personal stories of those who will be impacted by the passage of the Republican legislation. The Times lost out on its opportunity to put the president on the record on his top priority. Given how rare these chances have become, that’s a big miss. Kurtz: "What reporters has Palin talked to outside the Fox bubble?" In today's edition of the New York Times, Peter Baker discounted President Obama's assertion in last night's speech that "the time to embrace a clean energy future is now" and his suggestion that we set "standards to ensure that more of our electricity comes from wind and solar power." Baker suggested that clean energy's "connection to the spill... goes only so far," and stated that the expansion of the wind and solar industries "would not particularly reduce the need for... deepwater drilling" because "neither fills gasoline tanks in cars and trucks." In making this argument, Baker misses the point completely. The fact of the matter is that President Obama's policies have long emphasized an investment in hybrid vehicle technologies that will reduce our dependence on oil. In August, he announced an award of $2.4 billion in stimulus funds to "develop the next generation of fuel-efficient cars and trucks powered by the next generation of battery technologies." And companies are working to produce electric and hybrid cars that will be plugged in, instead of or in addition to being gassed up. While wind and solar energy may not fill cars' tanks, it will power their batteries. What Baker fails to acknowledge is that by ensuring that "more of our electricity comes from wind and solar power," Obama would ensure that those vehicles are powered with clean energy rather than with electricity produced by fossil fuel plants. Additionally, wind and solar power can be used to produce hydrogen which, according to the National Renewable Energy Laboratory, can be stored for use in vehicles' fuel cells. Contrary to Baker's assertion, investments in and implementation of projects such as these would both reduce the need for offshore drilling and fuel cars and trucks.